TORONTO, July 5, 2018 /CNW/ - Anaconda Mining Inc. ("Anaconda" or the "Company") (TSX: ANX) (OTCQX: ANXGF) is pleased to announce assay results from five drill holes (1,725 metres), as part of 11,588 metres of diamond drilling completed since October 2017 (the "Drill Program") at the Goldboro Gold Project in Nova Scotia ("Goldboro"). 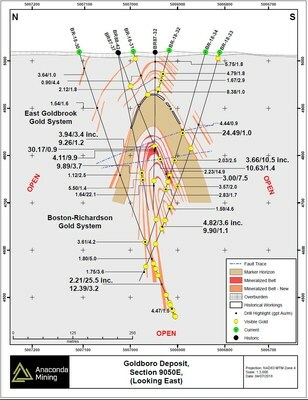 The five drill holes (BR-18-30 to BR-18-34) targeted eight mineralized zones of the East Goldbrook Gold System ("EG Gold System") and eight mineralized zones of the Boston-Richardson Gold System ("BR Gold System") along section 9050E of the Goldboro Deposit (Exhibit A). 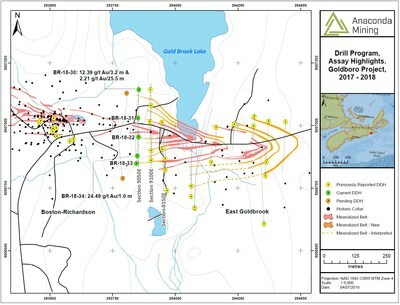 The Drill Program also tested the continuity of mineralization previously intersected in section 9100E located 50 metres to the east where multiple, wide, high-grade zones associated with fault systems were intersected, including 11.27 grams per tonne ("g/t") gold over 13.5 metres and 10.55 g/t gold over 6.1 metres (see press release of April 19, 2018). 3.00 g/t gold over 7.5 metres (270.5 to 278.0 metres) in hole BR-18-34. "The current drilling not only expanded mineralization, but also demonstrated the continuity of wide zones of mineralization between sections along the dominate plunging control on the Boston Richardson Gold System. In section 9050E, we found the continuation of the wide zones of mineralization and faults seen in sections 9100E and 9150E. Since initiating our exploration programs, which so far have included nearly 12,000 metres of drilling, we have expanded the deposit and continue to refine and increase the confidence in our geological model. In particular, drilling in section 9050E has extended all mineralized zones of the EG Gold System, and further extended the BR Gold System down to 550 vertical metres, an increase of over 250 metres in this section. Over the next several months, we expect to continue to demonstrate the significant growth potential of Goldboro with a substantial exploration program funded by the recent flow through financing." ~Dustin Angelo, President and CEO, Anaconda Mining Inc. The Drill Program was successful in hitting the eight mineralized zones targeted in the EG Gold System and discovered two mineralized zones that were not previously known (Exhibit B). Within the BR Gold System, all eight mineralized zones were intersected, extending the BR Gold System vertically an additional 250 metres to a depth of 550 metres in section 9050E (Exhibit B). Mineralization encountered in section 9050E also extended both the EG and BR Gold Systems westward by an additional 50 metres up plunge. Nineteen separate occurrences of visible gold were observed. On section 9050E, Anaconda tested the continuation of wide zones of mineralization ranging from 4.5 metres to 13.5 metres that were encountered in sections 9100E and 9150E. As anticipated, the Company intersected two zones of mineralization in section 9050E (7.5 metres wide and 9.9 metres wide) within the same corridors of mineralization as sections 9100E and 9150E (Exhibit C). The correlation across three geological sections indicates mineralization is continuous for at least 100 metres (Exhibit C). The faults encountered on section 9100E were also intersected on section 9050E, though it is not clear if the faults are necessarily correlated to gold mineralization. 3.66 g/t gold over 10.6 metres (239.7 to 250.3 metres) in hole BR-87-37 including10.63 g/t gold over 1.4 metres. 30.17 g/t gold over 0.9 metres (198.4 to 199.3 metres) in hole BR-87-32. This news release has been reviewed and approved by Paul McNeill, P. Geo., VP Exploration with Anaconda Mining Inc., a "Qualified Person", under National Instrument 43-101 Standard for Disclosure for Mineral Projects. All samples and the resultant composites referred to in this release are collected using QA/QC protocols including the regular insertion of standards and blanks within the sample batch for analysis and check assays of select samples. All samples quoted in this release were analyzed at Eastern Analytical Ltd.("Eastern") in Springdale, NL, for Au by fire assay (30 g) with an AA finish. Reported mineralized intervals are measured from core lengths. Intervals are estimated to be approximately 80-100% of true widths of the mineralized zones, except for drill intersections below 400 metres depth where the drill trace crosses to the northern limb of the host fold structure near the bottom of the hole. In these areas reported intervals may be less than 50% of true width. The Company also has a pipeline of organic growth opportunities, including the Great Northern Project on the Northern Peninsula of Newfoundland and the Tilt Cove Property on the Baie Verte Peninsula, also in Newfoundland. This news release contains "forward-looking information" within the meaning of applicable Canadian and United States securities legislation. Forward-looking information includes, but is not limited to, the Company's future exploration, development and operational plans. Generally, forward-looking information can be identified by the use of forward-looking terminology such as "plans", "expects", or "does not expect", "is expected", "budget", "scheduled", "estimates", "forecasts", "intends", "anticipates", or "does not anticipate", or "believes" or variations of such words and phrases or state that certain actions, events or results "may", "could", "would", "might", or "will be taken", "occur", or "be achieved". Forward-looking information is based on the opinions and estimates of management at the date the information is made, and is based on a number of assumptions and is subject to known and unknown risks, uncertainties and other factors that may cause the actual results, level of activity, performance or achievements of Anaconda to be materially different from those expressed or implied by such forward-looking information, including risks associated with the exploration, development and mining such as economic factors as they effect exploration, future commodity prices, changes in foreign exchange and interest rates, actual results of current production, development and exploration activities, government regulation, political or economic developments, environmental risks, permitting timelines, capital expenditures, operating or technical difficulties in connection with development activities, employee relations, the speculative nature of gold exploration and development, including the risks of diminishing quantities of grades of resources, contests over title to properties, and changes in project parameters as plans continue to be refined as well as those risk factors discussed in Anaconda's annual information form for the seven-month period ended December 31, 2017, available on www.sedar.com. Although Anaconda has attempted to identify important factors that could cause actual results to differ materially from those contained in forward-looking information, there may be other factors that cause results not to be as anticipated, estimated or intended. There can be no assurance that such information will prove to be accurate, as actual results and future events could differ materially from those anticipated in such information. Accordingly, readers should not place undue reliance on forward-looking information. Anaconda does not undertake to update any forward-looking information, except in accordance with applicable securities laws.